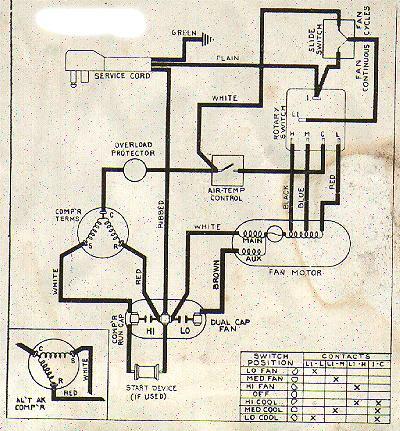 Sample wiring diagram - example purposes only! 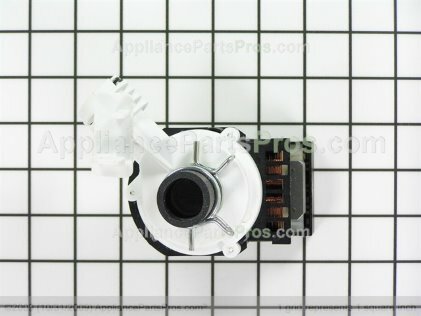 Air Conditioner- what is that part called? Videos have now replaced the mouse over pics we use to have. Q - The coils on the front of the air conditioner are frosting up...what's up? 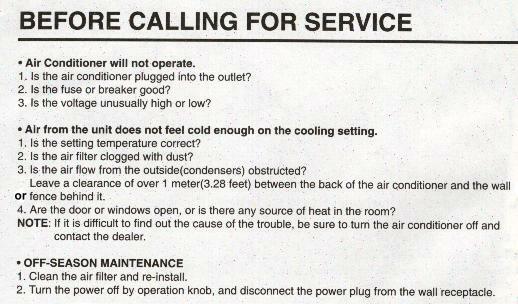 A - Often this is a sign that the air conditioner should be brought into repair shop for servicing. Common trouble makers are: - dirty condenser coil inside the a/c should be cleaned, fan motor gets oiled and a new filter is installed. Q - My air conditioner just "hums" and does not seem to be blowing any air, what's up? 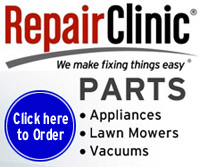 A - It is possible and happens a lot, the fan motor has seized up and needs replacing. Q - Water is leaking inside my room from the front of the air conditioner, what's up? 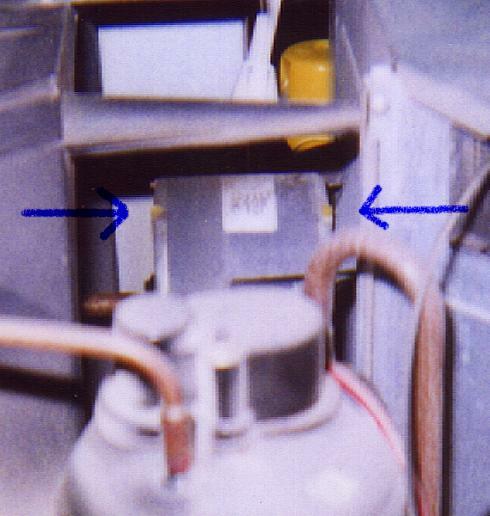 A - The evaporator coils on the front of the a/c produce water which normally travels though a drain system to the back of the unit where the water is evaporated. This drain is probably plugged and the water is running towards the front and leaking out. This is a sign that it is time to bring the a/c into repair shop for a thorough cleaning. Q - My air conditioner never drips any water out the back, isn't it supposed to? A - * Most room air conditioners are designed NOT to drip water out the back. 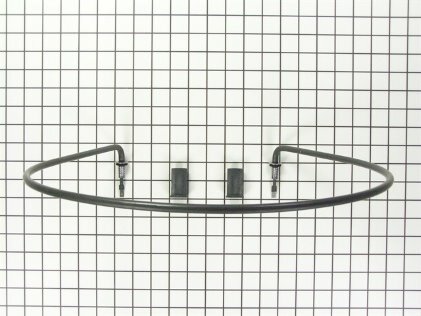 The condenser fan blade has a ring built into it to pick up the water and "sling" the water against the hot condenser tubing to help keep the coils cooler when the unit is running. This slinger can sometimes be heard "swooshing" the water around when the fan is running. This is one way modern a/c are use less hydro be reusing the cooler water to help cool the hot coils. * Usually only larger unit's may have a drain spout on the back of the a/c. Q - Will my air conditioner get colder if I open the air vent? A - No, this opens air door to the outside and actually will allow cold air to escape to the outside making it harder for the a/c to cool your room! Q - Any idea what size air conditioner I should buy for my room? What size air conditioner to buy? yourbestdigs.com has created an BTU calculator and it uses ENERGY STAR's BTU recommendations to suggest a BTU level that's ideal for your situation so you can save money. 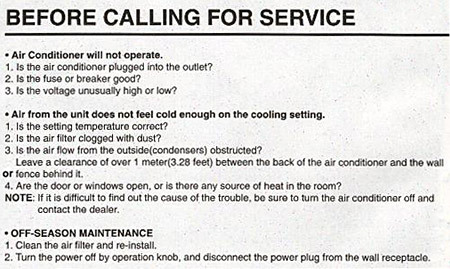 Q - Is there anything in my air conditioner that should be oiled? 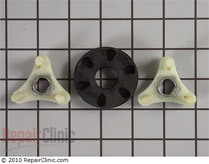 A - Not all fan motors have oil plugs, but if they do....the plugs should be removed, a few drops of 3in1 ( or something similar ) can be placed into the hole. 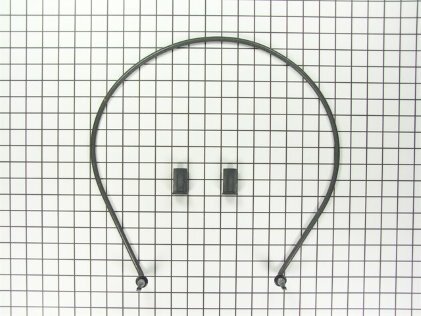 The plugs then must be re-installed to prevent dust from entering the motor oil holes. See picture here. Turn the air conditioner OFF and unplug it. NOTE: The air conditioner must be unplugged for the automatic filter clean timer to reset. 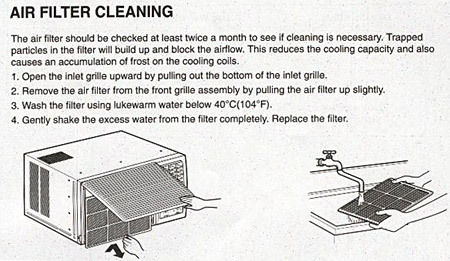 Clean the filter. 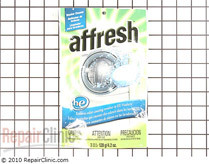 See the Care and Cleaning section in your use&care manual. 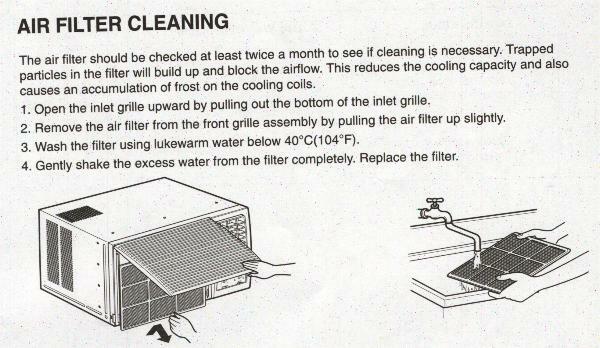 After cleaning, replace the filter and plug the air conditioner back in. 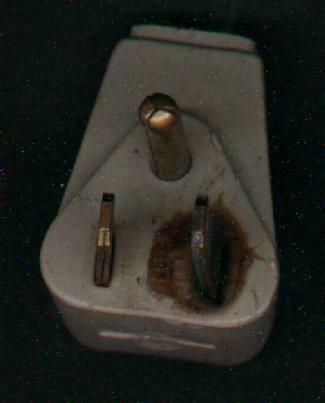 Er—Room temperature sensor failure. Call for service.